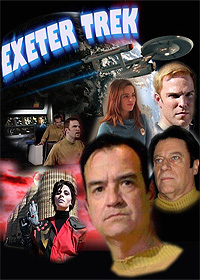 Exeter Trek (2015) - Sci-fi-central.com. USA  2015  Directed by: Wayland Strickland.  Starring: John Sims, Larry Fleming, Matt Jones, David E. McMahon, Thommy Berlin, Bill Bortzfield, Kenny Brazell, Amanda Costigan, Douglas Glenn, Charles Todd Gwynn, Katie Knowles, Jason Miller, Toni Lang Philips..
At the dawn of the 23rd Century - twenty years before the historic five year Starfleet mission began. The United Earth Space Probe Agency ordered the "Trailblazer" missions. A lone prototype star ship sent to keep the peace. How do you resolve a border dispute when neither side knows where the borders are? Your worst enemy may be the one you count on the most. The future of Earth lies in the balance. One ship. One crew. One destiny - to save the Human race. Space is not Humanity's for the taking.